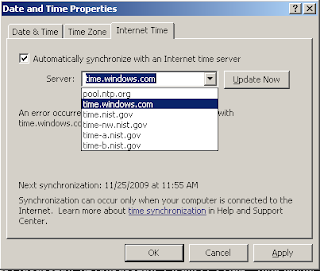 To see the error, double the clock in the systray, select the third tab which is labeled 'Internet Time', and try the 'Update Now' tab. 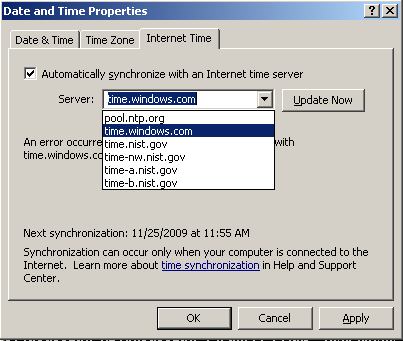 You will get the "An error occurred while Windows was synchronizing with time.windows.com" message. Try a different server, then 'update now'. Still get the error? and finally OK. Done, no more error messages. Ok, isn't that what I did? No. (blogger fonts are whack when you paste text in from a webkit browser... I'm going with it). What's missing? What did I do differently? After you change the value, you have to click apply to tell microsoft windows you changed it. What should be a obvious intuitive interface is subtly subverted. You change the value to X, and click update now. Doesn't it use that value? It says, "error connecting to X" but it doesn't use that value? Not til you click Apply! Why don't that have another button that says "ok, I clicked that button" ? but the XP system actually worked [but that was probably a bug]. I couldn't test on Vista, because the police took that computer. I only read about halfway, but I'm tired. Good thing I have a Mac now. This ensured my Internet Time synchronization started working again. I suppose w32tm and w32time commands are interchangeable from the responses I got:D."